The ocean encompasses a third of the Earth's surface, having an area of 179.7 million square kilometres (69.4 million sq mi and 161 million cubic mi) —significantly larger than Earth's entire landmass, with room for another Africa to spare. Extending approximately 15,500 kilometres (9,600 mi) from the Bering Sea in the Arctic to the icy margins of Antarctica's Ross Sea in the south (although the Antarctic regions of the Pacific are sometimes described as part of the circumpolar Southern Ocean), the Pacific reaches its greatest east-west width at about 5°N latitude, where it stretches approximately 19,800 kilometres (12,300 mi) from Indonesia to the coast of Colombia and Peru - halfway across the world, and more than five times the diameter of the Moon. The western limit of the ocean is often placed at the Strait of Malacca. The lowest point on earth—the Mariana Trench—lies 10,911 metres (35,797 ft) below sea level. Its average depth is 4,280 metres (14,000 ft). The Pacific contains about 25,000 islands (more than the total number in the rest of the world's oceans combined), the majority of which are found south of the equator. The Pacific Ocean is currently shrinking from plate tectonics, while the Atlantic Ocean is increasing in size. Along the Pacific Ocean's irregular western margins lie many seas, the largest of which are the Celebes Sea, Coral Sea, East China Sea, Philippine Sea, Sea of Japan, South China Sea, Sulu Sea, Tasman Sea, and Yellow Sea. The Strait of Malacca joins the Pacific and the Indian Oceans on the west, and the Strait of Magellan links the Pacific with the Atlantic Ocean on the east. To the north, the Bering Strait connects the Pacific with the Arctic Ocean. As the Pacific straddles the ± 180° meridian, the West Pacific (or western Pacific, near Asia) is actually in the Eastern Hemisphere, while the East Pacific (or eastern Pacific, near the Americas) is actually in the Western Hemisphere. For most of Magellan's voyage from the Strait of Magellan to the Philippines, the explorer indeed found the ocean peaceful. However, the Pacific is not always peaceful. Many tropical cyclones (typhoons, the equivalent of Atlantic hurricanes), batter the islands of the Pacific. The lands around the Pacific rim are full of volcanoes and often affected by earthquakes. Tsunamis, caused by underwater earthquakes, have devastated many islands and destroyed entire towns. Sunset in Monterey County, California, U.S.. The surface circulation of Pacific waters is generally clockwise in the Northern Hemisphere (the North Pacific Gyre) and counter-clockwise in the Southern Hemisphere. The North Equatorial Current, driven westward along latitude 15°N by the trade winds, turns north near the Philippines to become the warm Japan or Kuroshio Current. Turning eastward at about 45°N, the Kuroshio forks and some waters move northward as the Aleutian Current, while the rest turn southward to rejoin the North Equatorial Current. The Aleutian Current branches as it approaches North America and forms the base of a counter-clockwise circulation in the Bering Sea. Its southern arm becomes the chilled slow, south-flowing California Current. The South Equatorial Current, flowing west along the equator, swings southward east of New Guinea, turns east at about 50°S, and joins the main westerly circulation of the Southern Pacific, which includes the Earth-circling Antarctic Circumpolar Current. As it approaches the Chilean coast, the South Equatorial Current divides; one branch flows around Cape Horn and the other turns north to form the Peru or Humboldt Current. The andesite line is the most significant regional distinction in the Pacific. It separates the deeper, mafic igneous rock of the Central Pacific Basin from the partially submerged continental areas of felsic igneous rock on its margins. The andesite line follows the western edge of the islands off California and passes south of the Aleutian arc, along the eastern edge of the Kamchatka Peninsula, the Kuril Islands, Japan, the Mariana Islands, the Solomon Islands, and New Zealand. The dissimilarity continues northeastward along the western edge of the Andes Cordillera along South America to Mexico, returning then to the islands off California. Indonesia, the Philippines, Japan, New Guinea, and New Zealand—all eastward extensions of the continental blocks of Australia and Asia—lie outside the Andesite Line. The Pacific Ocean is the only ocean which is almost totally bounded by subduction zones. Only the boundary with the Antarctic plate is not a subduction zone. The largest landmass entirely within the Pacific Ocean is the island of New Guinea— the second largest island in the world. Almost all of the smaller islands of the Pacific lie between 30°N and 30°S, extending from Southeast Asia to Easter Island; the rest of the Pacific Basin is almost entirely submerged. The great triangle of Polynesia, connecting Hawaii, Easter Island, and New Zealand, encompasses the island arcs and clusters of the Cook Islands, Marquesas, Samoa, Society, Tokelau, Tonga, Tuamotu, Tuvalu and the Wallis and Futuna islands. North of the equator and west of the International Date Line are the numerous small islands of Micronesia, including the Caroline Islands, the Marshall Islands and the Mariana Islands. In the southwestern corner of the Pacific lie the islands of Melanesia, dominated by New Guinea. Other important island groups of Melanesia include the Bismarck Archipelago, Fiji, New Caledonia, the Solomon Islands and Vanuatu. Bathyscaphe Trieste, before her record dive to the bottom of the Marianas Trench, 23 January 1960. Important human migrations occurred in the Pacific in prehistoric times, most notably those of the Austronesians (specifically, the Polynesians), from the Asian edge of the ocean to Tahiti and then to Hawaii, New Zealand, and Easter Island. 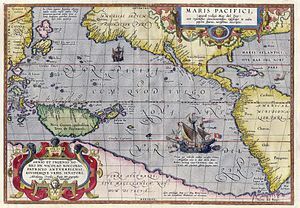 The ocean was sighted by Europeans early in the 16th century, first by the Spanish explorer Vasco Núñez de Balboa (1513), who crossed the Isthmus of Panama, and then by Ferdinand Magellan, who sailed the Pacific during his circumnavigation (1519-1522). In 1564, conquistadors crossed the ocean from Mexico led by Miguel López de Legazpi who sailed to the Philippines and Mariana Islands. For the remainder of the 16th century, Spanish influence was paramount, with ships sailing from Spain to the Philippines, New Guinea, and the Solomon Islands; the Manila Galleons linked Manila and Acapulco. During the 17th century, the Dutch, sailing around southern Africa, dominated discovery and trade; Abel Janszoon Tasman discovering Tasmania and New Zealand in 1642. The 18th century marked a burst of exploration by the Russians in Alaska and the Aleutian Islands, the French in Polynesia, and the British in the three voyages of James Cook (to the South Pacific and Australia, Hawaii, and the North American Pacific Northwest). Growing imperialism during the 19th century resulted in the occupation of much of Oceania by Great Britain and France, followed by the United States. Significant contributions to oceanographic knowledge were made by the voyages of HMS Beagle in the 1830s, with Charles Darwin aboard; HMS Challenger during the 1870s; the USS Tuscarora (1873-76); and the German Gazelle (1874-76). Although the United States conquered the Philippines in 1898, Japan controlled the western Pacific by 1914 and occupied many other islands during World War II. By the end of the war, the U.S. Pacific Fleet was the virtual master of the ocean. The exploitation of the Pacific's mineral wealth is hampered by the ocean's great depths. In shallow waters of the continental shelves off the coasts of Australia and New Zealand, petroleum and natural gas are extracted, and pearls are harvested along the coasts of Australia, Japan, Papua New Guinea, Nicaragua, Panama, and the Philippines, although in sharply declining volume in some cases. The Pacific's greatest asset is its fish. The shoreline waters of the continents and the more temperate islands yield herring, salmon, sardines, snapper, swordfish, and tuna, as well as shellfish. Marine pollution is a generic term for the harmful entry into the ocean of chemicals or particles. The biggest culprit are rivers that empty into the Ocean, and with it the many chemicals used as fertilizers in agriculture as well as waste from livestock and humans. The excess of oxygen depleting chemicals in the water leads to hypoxia and the creation of a dead zone (ecology). ↑ १.० १.१ "Pacific Ocean". Britannica Concise. 2006. Chicago: Encyclopædia Britannica, Inc.
(1985) Blue Horizons: Paradise Isles of the Pacific. Washington, D.C.: National Geographic Society. ISBN 0-87044-544-8. Lower, J. Arthur (1978). Ocean of Destiny: A Concise History of the North Pacific, 1500-1978. Vancouver: University of British Columbia Press. ISBN 0-7748-0101-8. Napier, W., Gilbert, J., and Holland, J. (1973). Pacific Voyages. Garden City, N.Y.: Doubleday. ISBN 0-385-04335-X. Oliver, Douglas L. (1989). The Pacific Islands, 3rd ed., Honolulu: University of Hawaii Press. ISBN 0-8248-1233-6. Ridgell, Reilly (1988). Pacific Nations and Territories: The Islands of Micronesia, Melanesia, and Polynesia, 2nd ed., Honolulu: Bess Press. ISBN 0-935848-50-9. Soule, Gardner (1970). The Greatest Depths: Probing the Seas to 20,000 Feet and Below. Philadelphia: Macrae Smith. ISBN 0-8255-8350-0. This page was last edited on ७ मार्च २०१३, at २१:३०.